The word poetry derives from poiesis, an act of making or doing. Taken in its broadest sense to mean human creativity and acts of aesthetic making, poetry is an action that reorganizes the world. 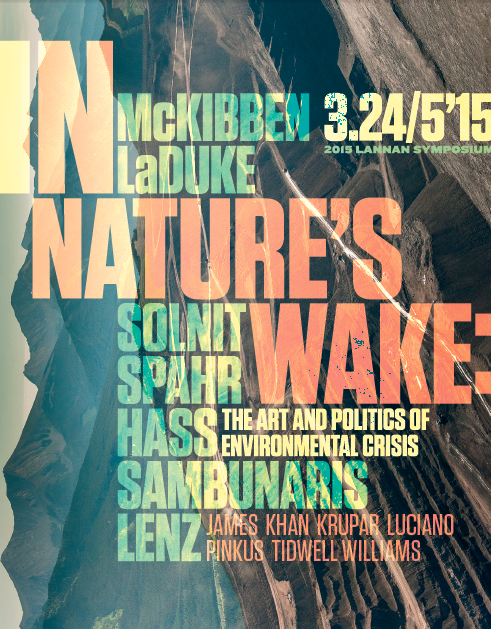 This Lannan Symposium asks what poetry and the related arts might do in the face of our ever-worsening environmental crisis. “In Nature’s Wake” will gather poets, novelists, activists, visual and performance artists, critics, and climate scientists to address the ongoing environmental crisis and assess the role of art in combating it. What aesthetic and conceptual responses are adequate to the new geological age we inhabit, the anthropocene, when human agency has altered decisively what had once been natural processes? What new conceptions of nature and human action does this moment require? And what new genres might emerge to make sense of this dramatically revised relationship between humankind and our lived environment? The diverse practitioners assembled over this two-day event will gather in readings, lectures, roundtable discussions, film screenings, and collective art exhibitions. The collective project that emerges will mingle elegies for a lost planet with manifestos for art in an altered world. Together these creative acts will be arrayed against the direst and most anti-democratic consequences of the climate disaster – its human costs – even as they suggest what forms of beauty and solidarity might emerge from the ruined nature we now inhabit together. What new forms of life can art help call into being, what new narratives can it tell, when nature veers toward death but we must, somehow, endure?